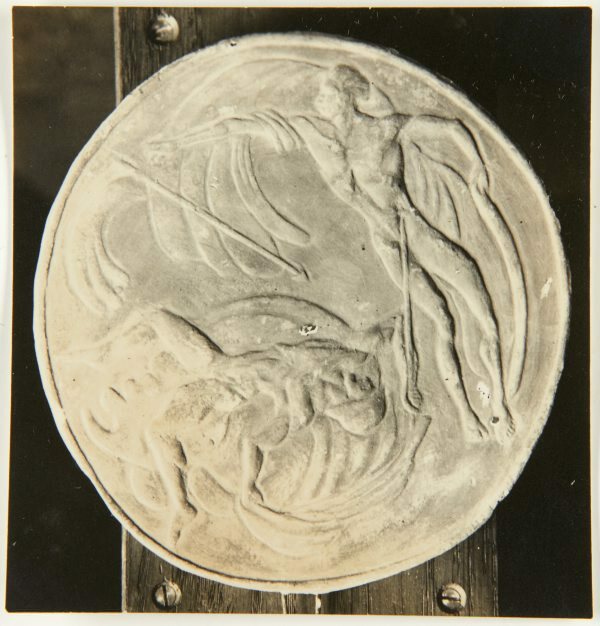 The subject of this medallion is not certain, though one possible reading is that the medallion symbolically tells the story of the flight of Icarus. The father of Icarus, Daedalus, fashioned wings out of wax and feathers for his son. He warned him not to fly too close to the sun. However, Icarus in a moment of vanity ignored his father’s warning. The wax that held his wings melted and he fell into the sea. Apollo was considered the god of the Sun and this medallion might show him spearing Icarus, who has plunged to the earth.